Are you looking for an easy way to make homemade meatballs? 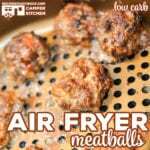 Our Air Fryer Meatballs are quick and simple to make AND our air fryer recipe is low carb! Mix together all ingredients except reserve 1 1/4 cup of the marinara sauce and the mozzarella cheese. Form mixture into 12 meatballs and place in a single layer in the air fryer basket. Cook in the air fryer at 350 for 11 minutes. Optional: Place meatballs in an air fryer pan, toss in remaining marinara sauce and top with mozzarella cheese. Place air fryer pan into the basket and cook at 350 for 3 minutes. This is an air fryer recipe, if you are looking for the crock pot version of this recipe it can be found here: Crock Pot Meatball Parmesan. We used a Power XL Air Fryer in this recipe. You can check out a full list of our favorite slow cookers, electric pressure cookers and other kitchen essentials in our Amazon Influencer Shop. We used this air fryer pan in this recipe. If you are looking for more air fryer recipes, you can find them in our Air Fryer Recipes Library. We are slowly adding more recipes that we test. If you are looking for more low carb recipes, you can find them in our Low Carb Recipes Library. We add new recipes to this page weekly. We use this marinara sauce in our recipes to keep our carb counts down. All cooking appliances cook differently, so cooking times are always a basic guideline and should always be tested first in your own air fryer and time adjusted as needed.